What currently affordable car is a future collector vehicle? Before many collector vehicles were collector vehicles, they were just used cars. Besides obviously rare and exotic cars chances are there was a time when someone thought the collector car of your dreams was just a cheap old car. With this in mind we want to examine the cars that are currently just old cars but will be desirable collector's items in the future. What currently affordable car is a future collector vehicle? 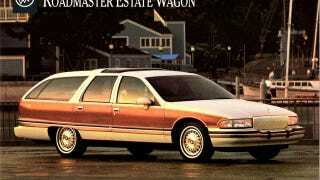 I've been convinced for a while that LT1 equipped GM B body wagons (Caprices and Roadmasters) from 1994-1996 are future collector vehicles. Although examples of the last of the traditional large RWD American station wagons can be still be had for not much money I don't think that will be the case a couple decades from now. As clean low mileage examples become harder and harder to find I think these large wood covered wagons will become sought after. It might sound crazy now but one look at a vehicle like this 1968 Caprice wagon goes a long way towards reinforcing my point.